I love Indian cuisine with all its glorious spices and heat. But every once a while, I go beyond the boundaries and experiment with World Cuisine. I recently got this book from the library called "The Food of Morocco" and have been fascinated by the lifestyle, their kitchen, tagines, local ingredients and ways of cooking. The Moroccans characteristically use only ground ginger and never the fresh roots. In North of India, only the Kashmiris are known to use ground ginger or soonth in their cooking. I wonder if there is any cultural history between the two. 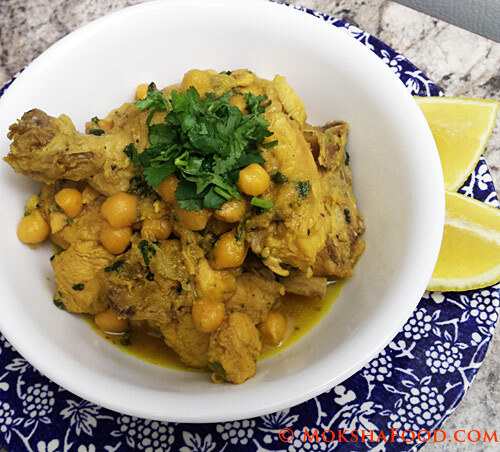 The first recipe is tried is called K'dra Djej or Chicken with onions and chickpeas. This is a very mild and flavorful recipe which is usually enjoyed with bread or couscous. 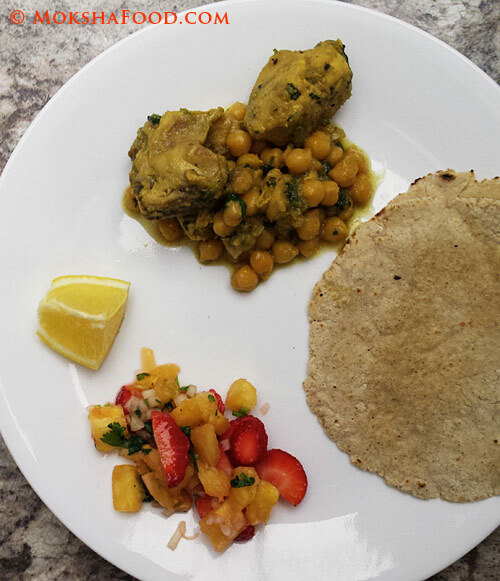 We had it with sorghum/jowar rotis/flat breads and pineapple strawberry salsa, prepared by my daughter. She is turning a pro at salads. The K'dra is an indigenous Berber recipe made with generous amounts of Herbed Smen (Clarified butter/Ghee) and onions. This got me very interested because of its close proximity to Indian Cuisine. The addition of chickpeas and saffron heightened my curiosity till i had to make it at home. Being the health freak that I am, I have reduced the amount of ghee. I don't think that affected the taste as the final result was very flavorful with just minimal seasonings. The Berbers usually brown the chicken after braising it to give a nice golden crust and improve presentation and flavor. My chicken pieces were too small to see the effect so i skipped this step. If you are using big chunks of chicken then after they have cooked till tender, spoon some of the fat in another pan or just heat some more ghee in another pan. Pick up the chicken pieces from the sauce and let the sauce drain off. Fry the chicken in its own fat in another pan till it develops a golden crust. Serve with the rest of the sauce. In a large saucepan, melt the ghee on medium temperature. Add in the dried ginger and saute for a few seconds. Drop in the onions and fry them till they have softened. Add in the rest of the spices - cinnamon stick, black pepper, turmeric powder. Add in the chicken pieces now and coat well. Add in the chickpeas, saffron and salt. Pour about 1/2 a cup of water, cover and cook on low medium heat till the chicken is done. Garnish with chopped cilantro and serve with lemon wedges. 1. Original recipe didn't have turmeric powder. I added to give a nice light yellow hue. 2. You can also use canned chickpeas. Just add it towards the end of cooking process.